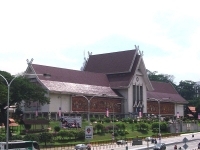 Designed to reflect the region's Minangkabau architectural style, the National Museum houses many of Malaysia's cultural treasures and historical artefacts. Its ethnographic and archaeological exhibits include life-size dioramas of traditional Malaysian life. Puppet-shadow-play (wayang kulit) displays show the country's ancient artistry, while exhibits of traditional weapons such as daggers (kris) and machetes (parangs) reveal Malaysia's pride in functional aesthetic forms. Travellers should note that the museum covers a lot of time and subject matter, and suffers from an occasional lack of linkage between periods. For this reason, visitors should join one of the free guided tours. Photography is permitted, though only with a hand-held camera and for private use. Visitors will find a shop and cafeteria, and features for disabled guests. Opening times: Daily 8am to 6pm. Admission: MYR 5 (adults); MYR 2 (children aged 6 to 12).